U.S. corn exports increased 71% year over year during first half of marketing year. U.S. exports of feed grains in all forms increased 33% year over year in the first six months of the 2016-17 marketing year, according to recently published trade data from the U.S. Department of Agriculture and an analysis by the U.S. Grains Council (USGC). The data showed that the U.S. exported more than 56.6 million metric tons of feed grains in all forms -- a calculation that measures grain products in corn equivalent -- from September 2016 to February 2017, compared to 42.5 mmt during the same period of the prior marketing year. Leading the increase, exports of U.S. corn increased 71% year over year during the first half of the marketing year to 27.8 million tons (1.09 billion bu. ), compared to 16.3 million tons (641.7 million bu.) the prior year. Exports as of February 2016 represented 58% of the last marketing year’s total volume. Additionally, USGC noted that exports of U.S. meat produced with feed grains, including beef, pork and poultry, increased from 9.9 million tons (389.7 million bu.) to 11.5 million tons (452.7 million bu.) in corn equivalent year over year, an increase of 15%. As of February 2017, U.S. ethanol exports also increased substantially during the first six months of the 2016-17 marketing year, reaching 82% of the total volume for 2015-16 at 711 million gal. (6.45 million tons, or 253.9 million bu. in corn equivalent). That volume represents a 66% year-over-year increase, up from 428 million gal. (3.88 million tons, or 152.7 million bu. in corn equivalent) during the same time frame in the last marketing year, USGC said. U.S. exports of dried distillers grains with solubles also increased slightly, rising 3% year over year despite trade disruptions in two major markets: China and Vietnam. U.S. dried distillers grains exports totaled 5.9 million tons in the first six months of the 2016-17 marketing year, compared to 5.7 million tons the prior year. 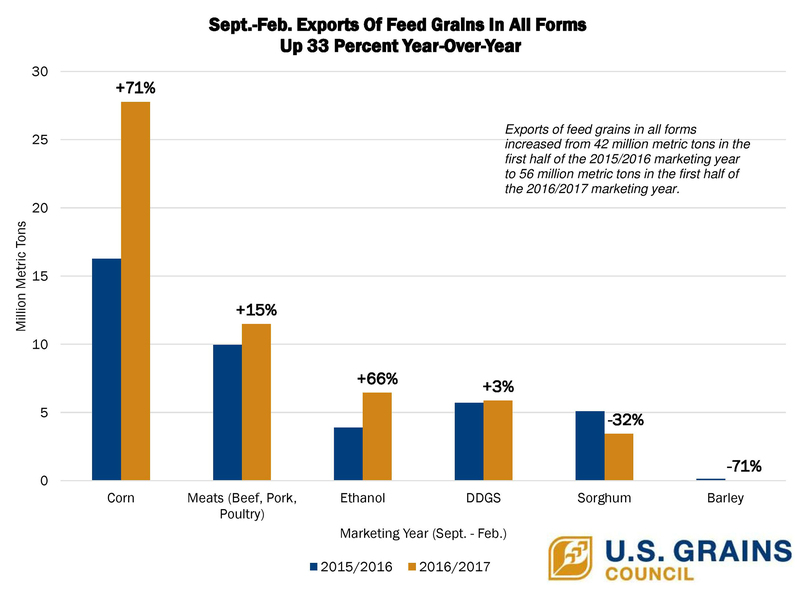 While overall feed grain exports increased, USGC pointed out that exports of both sorghum and barley declined in the first six months of the 2016-17 marketing year. U.S. sorghum exports decreased from 5 million tons (196.8 million bu.) to 3.4 million tons (133.9 million bu.). Smaller purchases by China drove the sharp decline. U.S. barley exports decreased from nearly 143,000 tons (6.57 million bu.) to about 41,000 tons (1.88 million bu.) due to a decline in exports to Mexico. USGC said it’s planning programs and activities that aim to ramp up U.S. feed grain exports in the remaining months of the 2016-17 marketing year in order to reach a third straight year of 100 million tons of exports of U.S. feed grains in all forms.